A video Happy New Year from frozen Boulder County, Colorado. Its 14 degrees and lightly snowing. Happy New Year! . Roy Underhill has been working with wood since I was a tiny little kid. In 1979 he started the “The Woodright’s Shop” which has turned into PBS’s longest running how-to show. For 38 years, Roy has been inspiring generations with his passion for woodworking and keeping the old methods of hand planes and good old fashion skill alive. In fact, in episode 37 episode 6, Big Ash Mallet!, Roy pokes fun at the inability to find a quality mallet for sale. He goes to say modern manufacturers truly want woodwright’s to make their own mallets because the glued mallets for sale are worthless. Go Roy! As we exit 2017, we all need to heed the lesson of the Big Ash Mallet and look toward 2018 with a bit more passion, self-sufficiency, and simplicity. Without a doubt, 2017 was a rough year with a horrible president-elect being inaugurated, countless legislative terror attacks on the American people by the Republicans, and a number of personal challenges I personally had to overcome. As I reflect back on 2017, I say goodbye and good-riddance. The roughness is inspiration for us in 2018. The best moments of 2017 are worth celebrating. They provide a foundation of fun for 2018. The best moment was riding on Grumpy, a NAA B-25D bomber operated by the Historic Flight Foundation. 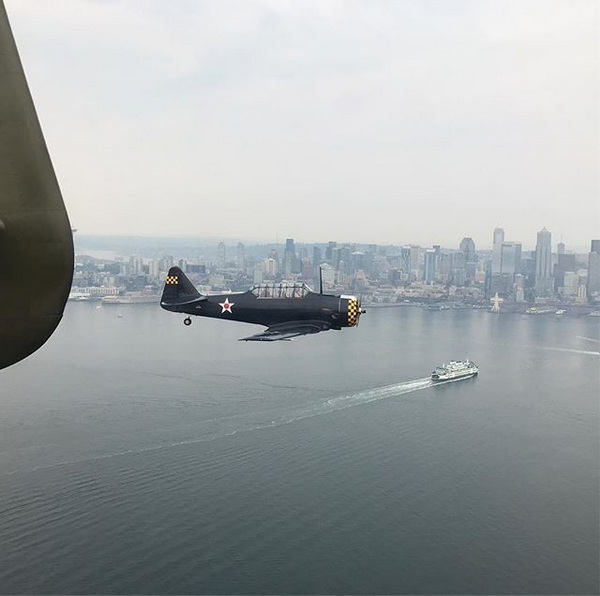 We flew from Paine Field in Everett, Grumpy’s base, south down the coast to downtown Seattle. We made a flyby of Boeing Field and the Museum of Flight before returning to Paine Field. I say “we” because a NAA T-6 Texan was flying off our wing at all times, remarkable! The second best moment was my August road trip to Colorado from Seattle. After a tumultuous start to the year, a job change and the decision to move away from Seattle, I gave myself a vacation after a number of years. Driving through Montana and visiting Missoula, Bozeman and Billings made me appreciate the wonderful beauty of our country, the value of fresh air, and even reminded me how confining the Seattle region really is. The short visit to Little Bighorn Battlefield was nothing short of breathe-taking. On this trip, I found the curious soul who had been hiding while living in Seattle. The decision was made on this trip to relocate to Colorado. Other moments include sleeping with the cat in the car at a rest area outside of Boise, Idaho on our last trip to Colorado. I also enjoyed my visit to the Old Idaho Pen. Moments from Seattle include spectacular sunsets from my deck, rainbows in Snoqualmie Pass, and having lunch in Mukilteo, watching the ferries come and go. I decided to use the “CoST2” concept to consider what I should be continuing, stopping, or starting as actions as we move into 2018. CoSt2 is an exercise where you evaluate what you will continue doing, stop doing, and start doing in the new year. I heard about it on a podcast on my road-trip and decided to give it a try. Overall, the idea for 2018 is to stop being so dependent on technology and start moving a bit more, leading to a healthier lifestyle. All the while, staying curious and trying to save America. Every year I pick three words which guide my values, principles and actions for the year. They almost create a theme or lens to see the year around. In 2017 I chose, connect, learn, build. It worked well, I spent a lot of time connecting with myself and my community. I spent a lot of time learning about local history, python, and data visualization. I also spent time building a foundation for 2018 which included setting blogs, building strategy, messaging and laying the groundwork for a focused 2018. Plan – do your research and create a plan so I am prepared. Explore – I now live in the beautiful state of Colorado and have a lot of exploring to do. I also need to explore more options for the future. There is also a certain amount of exploration to do within my own social community. 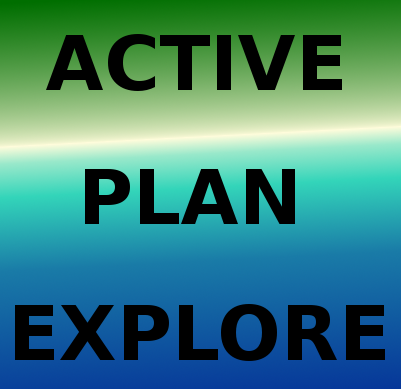 So, active, plan, and explore are the words to live by in 2018. These are also consistent with my CoSt2 exercise for 2018. So what does Roy Underhill have to do with this? He is a reminder of what we need to recognize in 2018. We cannot let the wonderful methods, skills, and people who built this once great country with their hands and ingenuity be overlooked. With the technological revolution in the past ten or so years, we are starting to forget the feel of wood in our hands. We are starting to forget the smell and wood shavings and the joy we get from making something with our hands. Technology does play a vital role in our globalized world and offers many conveniences. But we cannot let it steal our past and dictate a boring future of sheer convenience. After-all, when the power goes out for good, who’s going to be able to make a chair, let alone a 2×4? See you soon in 2018! During my triathlon years, I was amazed with the impact data has on a training program. GPS devices, wearables, and tracking apps seriously changed how triathletes viewed their training. Rather than going by feel, triathletes could “see” their workouts with data visualizations. Areas for improvement were quickly identified and brought to the front for full attention. As technology continues to improve, our wearables get more complex and accurate, and triathlons become more competitive, we need a better way to digest our data. Very much as Tableau has created a better and more robust platform for visualizing and forecasting business data, this same functionality must come triathlon. What is the real problem? It is the same problem I tried to address with TrainingMetrix, combining all of a triathlete’s data into a single source to derive insights and forecast future workouts. To this day, we still deal with separate databases and apps for our workouts and nutrition. Companies like Garmin and MyFitnessPal have improved integration, bringing nutrition and workout data a tad closer. But, we are still missing the insights… the indicator of diet quality, the indication of over training, and the ability to see progress at the highest level. Where does this go from here? It starts a new era in research and passion. For myself re-entering triathlon training has renewed my search for the ultimate solution. In future posts, we will explore some of the solutions on the market including what is good and what is bad. For a bit more than the last decade, my career has focused on data and data visualization within sales, marketing and finance. From understanding data architecture and database design to deploying insightful and effective reports to teams across the organization, I have come to appreciate the profound role data plays in today’s highly competitive marketplace. Understanding how to use data and integrating it into one’s daily routine is a challenge for many. As I reflect back on my career and the challenges for sales reps and analysts ahead, I chose to shift gears and focus on sharing my experiences with a greater audience. With the purpose of sharing my skills, I created Saalun. Saalun is short for Sales Analytics University. The subscription based service is geared toward sales reps and analysts. While sales leadership can also benefit, the product is to help reps get the training they need without relying upon corporate leadership to provide it. While we are just launching an early preview, we will open the doors in Q4’17 with content, newsletters, webinars and podcasts. Head over to our site and signup for notifications, early previews, and the latest news on this exciting project. Sales Compensation is not easy. Throughout my career, I have seen plans which break the sales budget to plans which do are insulting to the rep as they pay too little for a lot of work. I refer to sales compensation programs as a form of art which requires a bit of science. Science is pretty easy as it is understanding how your team should be selling your product and how it translates to the pipeline and corporate goals. This understanding translates to key performance indicators (KPIs) which one can use to monitor rep performance and team performance. The art plays in as you develop the actual plan and which KPIs enter that plan. Average Deal Size, Number of Meetings, or Conference Attendees may not necessarily be the best indicators of sales. With a mix straight sales revenue compensation (say 2%) and additional kickers and bonuses, the art of using plan structure for influencing rep behavior can take trial and error to get right. Finally, the best compensation programs leverage transparency, reporting, and recognition. This is plan implementation where making sure the rep understands their KPI progress and how it translates to their paycheck. Regular reporting and team leaderboard distribution are essential, motivating and drive revenue. A proactive analytics program can ease the calculation and payout of compensation at the end of the quarter.